One of the best things about the Italian summer is GELATO! Creamy, fruity or chocolaty, rich in flavor and refreshing. 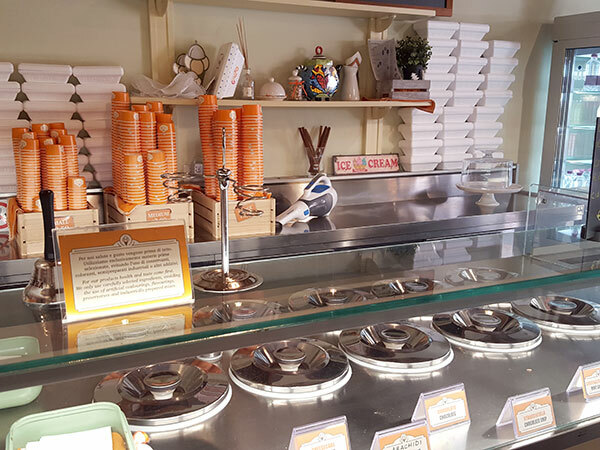 Any time of day is the right time for a gelato: you can have it for breakfast, lunch, dinner or as a snack on the go. 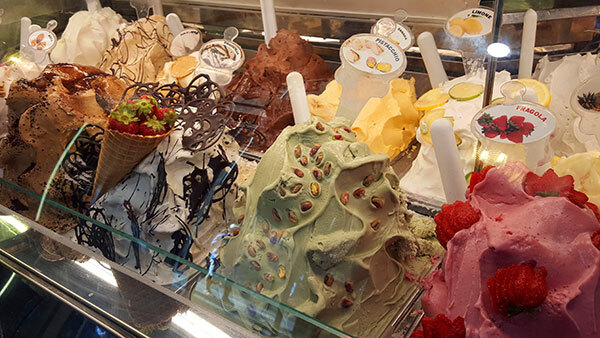 In Italy, you can get a gelato on almost every street corner, from bars to specialized ice cream parlors, the choices and flavors offered are endless. There is a big difference, however, in the quality of mass-produced gelato and genuine, all-natural gelato made by an artisan. And it’s the gelato of the latter that you’ll want to taste during your vacation in Italy. The colorful mountains of ice cream you’ll find on display in the bars in crowded tourist streets might look attractive, but in fact, bear very little resemblance to genuine artisan gelato. We met up with artisan gelato maker Marco Ottaviano of Il Gelato Gourmet to learn more about the art of gelato making. Marco produces his artisan gelato fresh every morning in the laboratory of his shop in Via Matteo Palmieri 34R in the historic center of Florence. Being a true artisan with a passion for his work, he only uses fresh, and when possible, local products. Usually, his gelato consists of 40-50% fresh seasonal fruit provided by his trusted supplier at the Mercato di San Lorenzo. Inside his shop, while tasting his fabulous peach gelato, Marco explained the key points to us. It is in fact very easy to spot the difference between low-quality factory made product and gelato created with fresh ingredients by an artisan gelato maker. The first thing to avoid are the mountains of whipped up gelato. For gelato to be that high, it has to be loaded with cream, sugar, and chemicals. It’s kept out in the open for days, sometimes even in the sun, and it contains a lot of preservatives to keep it that perfect. This low-quality ice cream arrives straight from the factory where it is manufactured in industrial quantities and shipped out to the bars. Artisan gelato is made with all fresh ingredients, without the use of preservatives and colorants, and therefore it remains at a low level in the container; sometimes the product is even covered to preserve the quality of the gelato. An artisan gelato maker gets up early in the morning and produces the gelato from fresh ingredients on a daily basis. It is time-consuming to create gelato from scratch with only fresh ingredients, and therefore the number of flavors is limited and often change with the seasons. Often you’ll find special and unusual flavors in the artisan shop. 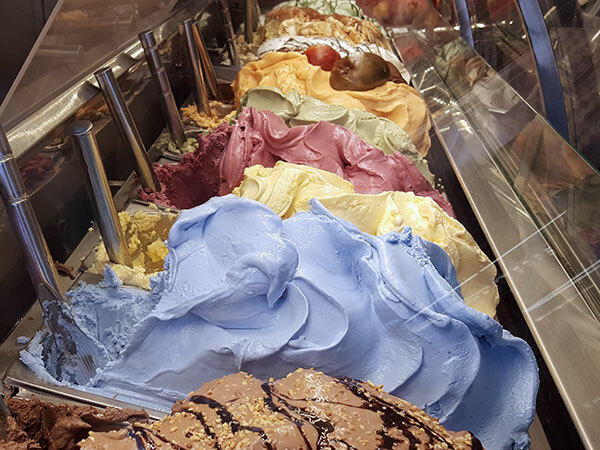 Artisan gelato doesn’t have a lot of color, except for chocolate or bright colored fruits like mango or strawberry. Pistacchio, on the other hand, shouldn’t be green; the real color of the nuts is light brown. Mint ice cream shouldn’t be bright green either, the plant is green, but gelato made from mint is more of a white almost transparent shade. The Smurf gelato is of a vibrant blue; that is not a color you can create with only natural ingredients. Artificial colors make the gelato look more attractive, but it is the taste that really matters. The industry today has taught us to eat with our eyes and not our mouths, so CLOSE YOUR EYES AND TASTE! A genuine gelato is not too sweet or creamy; it leaves a fresh and pleasurable taste in your mouth. It’s an art to determine the right balance between the primary ingredients as milk, cream and sugar and the characterizing ingredients such as fruit, and chocolate that give flavor to the gelato. Sugar is a fundamental element, not only provides it the sweetness to your gelato, but it also functions as a natural preservative. If the gelato is too sweet or too fat, you can’t taste the flavors anymore, and it will leave you thirsty after eating it. A real artisan gelato maker only uses fresh, natural, and preferably local products. Look for the list of ingredients that, by law, should be displayed inside the shop.